The number 3 ranked Hurricanes beat the ACC rival Cavaliers 44-28 on Saturday! 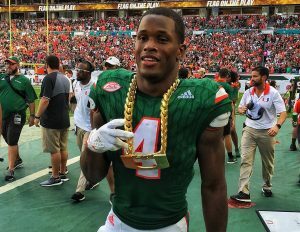 On Saturday, November 18th, the 7th ranked ‘Canes soundly beat Virginia to make thee Ranking Committee know they deserve to be discussed as a playoff team. Passing & Receiving// Starting QB Malik Rosier threw for 210 yards and 3 Touchdowns. Ahmmon Richards led the canes receiving 51 yards and a touchdown. Rushing //Travis Homer rushed for 96 yards on 17 carries and a touchdown. Malik Rosier also added 38 yards on nine carries and a touchdown. Defense // Miami’s defense held their own against UVA’s offense. They limited the Cavaliers to 23 yards on the ground, the defense stopped the Quarterback when it counted causing five sacks, a fumble and a 30 yard interception for a touchdown by Jaquan Johnson. Special Teams// Michael Badgley was 1/1 on field goal attempts and 5/6 on extra point attempts. Notes// This week the Canes will take on Pitt on Friday at 12 in Pittsburgh!